Tim Carty rides the PMC in memory of his brothers David and Peter. 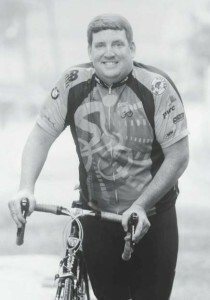 It was the death of Timothy Carty’s brother David that got him to ride his bike 190 miles from Sturbridge to Provincetown, MA in 2009 as part of the Pan-Mass Challenge. David had been battling non-Hodgkin’s lymphoma for ten years until he passed away at age 49 – leaving behind a wife and three young children. “David was my oldest brother [of five siblings]. We were the closest. He was the one I looked up to,” recalls Tim, who lives in Charlton, MA with his wife Kathy and two boys Christopher (age 11) and Nathan (age 8). In fact, after Tim graduated from high school, he spent the summer with his brother cycling. “He was really into bicycling —much more than I was,” recalls Tim. Tim decided to honor his brother’s memory by becoming a rider for the Pan-Mass Challenge (PMC). Each August, thousands of cyclists from around the country ride across Massachusetts on courses of up to 190 miles and raise millions of dollars for cancer research. Just two months after Tim’s PMC ride in 2009, his older brother Peter was diagnosed with a rare, aggressive form of cancer. He died two months later. “My parents lived through both losses. At the time, to see my mother go through that again for the second time was nearly unbearable,” he says. Billy Starr, founder and executive director of the Pan-Mass Challenge, understands all too well the devastation of losing multiple loved ones to cancer. His mother died from melanoma in 1974 at age 49 —the same age as Tim’s brother. Within a few years, he lost an uncle and a cousin to cancer as well. In 1980, Billy organized a group of 36 cyclists to ride 220 miles from Springfield to Provincetown. They collectively raised $10,200 for the Jimmy Fund at Boston’s Dana-Farber Cancer Institute, and the Pan-Mass Challenge was born. According to Billy, it was his mother who had instilled a sense of giving back. Never could he or she have dreamed how far-reaching that simple but profound life orientation would extend. The PMC has raised more money for charity than any other single event in the nation: to date, the PMC has donated $338 million dollars for cancer research and treatment to the Dana-Farber Cancer Institute. “The success of this event is due to the fact that all PMC riders are encouraged – actually required – to take their fundraising commitment as seriously as their physical commitment to ride the event,” says Billy. On August 4 and 5, 2012 founder Billy Starr and father Tim Carty will join 5,500 other cyclists for the 33rd Annual Pan-Mass Challenge. The goal is to collectively raise $36 million dollars for cancer while paying tribute to thousands of cancer patients, survivors, and victims. Billy says the magic of the PMC weekend comes from so many people – riders, volunteers, supporters, and spectators – bonded by a single cause. “On PMC weekend there’s an environment created that people would love to see recreated in their homes and their places of business—it’s so dynamic and so positive,” he says. The PMC’s mission is to change that for good, through increasingly larger annual donations toward cancer research with the big dream of “discovering cures for all cancers.” The PMC is the only fully-supported bike-a-thon in the country where 100% of every rider-raised dollar goes directly to cancer research and support. The incredible efficiency of the PMC is due in large part to the 3,000 individual volunteers and over $4 million of goods and services provided by 200 corporations – all who help provide water, first aid, food, lodging, and more – without taking one penny from the riders’ donations. It’s not just the volunteers and sponsors that provide support. All along the routes, hundreds of people come out to cheer on the riders as they pedal their way toward the finish. For Tim, that swell of human support is what gets him over the tough spots on the way to Provincetown. “Everybody comes out. You see kids are carrying jugs of water, waving signs. That’s what’s truly amazing – the outpouring of generosity,” he says. Tim’s most avid supporters are his wife Kathy and two boys, Christopher and Nathan, who cheer him on through the entire weekend. They first meet him as he rides through their home town of Charlton. Then their weekend-long trek begins. “We try to stop at as many water stops as we can to cheer him on. The boys make signs every year to hold up in support of their dad,” Kathy says. The family spends the night at a hotel on the Cape, and then gets up at the crack of dawn to see their dad off at the Sunday starting point: the Bourne Bridge. They then drive to the PMC Family Finish in Provincetown to celebrate Tim and the other riders’ finish. “The boys and I look forward to making the trip and cheering him and the other riders on every year. It’s become a tradition,” she says. Tim rides with a group of five riders called Team HOPE (Helping Oncology Patients Endure). He and his fellow HOPE riders are “like a family,” Tim says. For the Carty family, like so many other Massachusetts families, the Pan-Mass Challenge has become a capstone event that provides meaning, memories, and a sense of purpose. “It feels like a sense of accomplishment. You’ve done something to benefit society through raising the money. And it just so happens that I like to ride a bicycle, too,” says Tim. Tim and Kathy’s son Christopher participated in a six-mile Kids PMC ride in Upton last year, and Nathan is “learning to ride his bike,” says Tim. The kids have learned a lot about cancer – both through their uncles’ deaths, and their parents’ involvement with the PMC. The Pan-Mass Challenge is a way to do that, no matter what one’s age or riding ability. And the experience is truly life-changing. The PMC Kids Rides have grown since 2005 to include over 35 towns across Massachusetts and neighboring states. The pint-size bike-a-thons are geared for kids of every riding ability, from three-wheeling three-year-olds to ten-speed teen riders. Every ride offers kids the opportunity to do good by raising funds for cancer research, participate in a family-fun local event, and enjoy the challenge of completing a ride. For more information on PMC Kids Rides, or to learn how you can start a ride in your community, go to http://www.kids.pmc.org or contact Sarah Mercurio at sarah@pmc.org.